That’s 2164 points for the first 2 events. Nice. 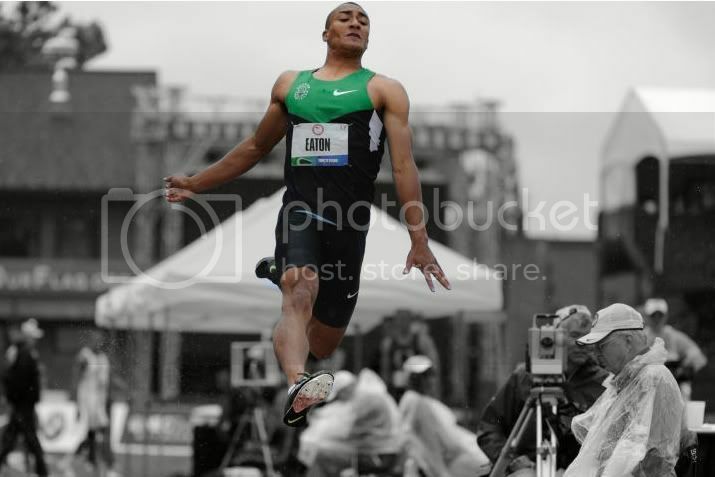 If Ashton is close to his PR in the shot and the 400, and PRs in the HJ (which he is primed to do), he could have a 4800+ after Day 1.
that’s the olympic a in the long jump. my goodness. And only .03 off in the 100, with less than the allowable wind. Here is the record jump. With his 100m and long jump performances already that would be an almost alien effort. Are we even sure he is human? TV made it sound like he did a short approach in high jump due to it pouring down raining. Then it started raining even harder when he ran the 400 in 46.7 (his pr being around 45.3). If he is remotely around his PRs in day 2 he will have the World Record. A slight off day could still be the USA Record. PRs for day 5 bring him to 9118 using only outdoor, if you go off indoor his vault is another bar higher. Ashton’s full HJ approach is basically a jog into a 4 step, it’s always that short. New PR in the vault! Tied it. He’s cleared 5.20 before. Pretty sure if he hits exactly his PRs in the last two events he gets the WR by three (!) points. Decathlon PR and AR seem extremely probable. EDIT: A random person on letsrun has also done the addition and gets the same result. Needs a PR in the 1500 for the WR (someone else can do the math exactly this time); needs to “jog” to get the AR.